My second great grandfather THOMAS MAGRUDER BRASHEAR (a/k/a T. M. BRASHEAR) is a source of endless fascination for me. He was born in Maryland but later moved to Tennessee, where he raised a family and died in 1882. I’ve always wanted to know why he ended up in Tennessee. My Land Records course at St. Michael’s College gave me the idea to search for a land grant. My fingers headed over to the Tennessee State Library and Archives site (http://www.tennessee.gov/tsla). 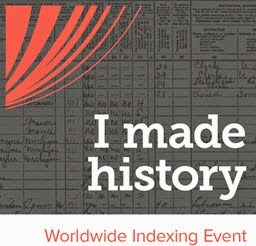 I then searched for “Land Grants” and found this link (http://www.tennessee.gov/tsla/history/howdoifind.htm#08), which stated that one could e-mail the TSLA with the name of an individual and they would check their index and respond promptly. I did just that and, true to its word, the TSLA responded in less than a day. Sure enough, they had two records on good old T.M. This is part of the e-mail I received. 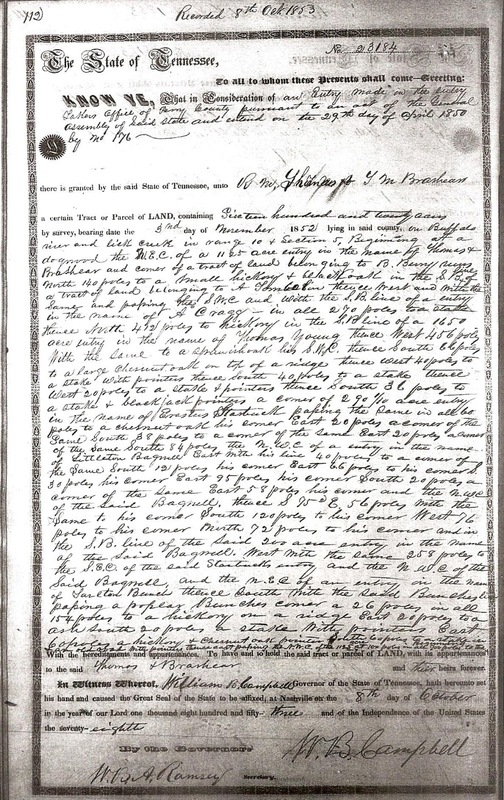 This grant for land in Perry County, Tennessee was entered into in 1850 and recorded in 1853. The recipients were T.M. Brashear and R. M. Thomas. I now needed to know who Mr. Thomas was and his relationship with T.M. After researching Census records, it appears that Mr. Thomas (if I have the correct R.M. Thomas) was born in North Carolina about the same year as T.M. Further research indicates that R. M. Thomas was a Chancery Court Clerk and Master in 1860. T.M. Brashear was a Chancery Court Clerk and Master from 1865-1868. So, T.M. and R.M. were born about the same time but in different states, both owned plenty of land in Perry County, Tennessee, and both worked in the legal field. I am wondering if they met at college. That’s another avenue to explore. Or, perhaps they were half-brothers. They both have the middle initial "M," which sometimes stands for the mother's maiden name. In addition to the name R.M. Thomas, the land grant contains the names of owners of adjacent parcels to T.M.’s land. Those names must be investigated too. This land grant has generated even more questions. I think this is true of genealogy. The more you learn, the more you have to learn. It is an unending process, a wonderful hobby. I am very pleased with the Tennessee State Library and Archives. Despite my not living in Tennessee, they helped me out quickly and efficiently. It can be very frustrating to desire records that are far away. Thank you, TSLA! (http://us-census.org/pub/usgenweb/census/xtn/perry/1860/notes.txt: accessed September 11, 2012).